Last week an incident broke out in the Beijing subway system. A young woman got into an altercation with her apparent boyfriend over a mobile phone game, it seems. The end result: she dragged the man onto a subway train. But was this just a PR stunt? 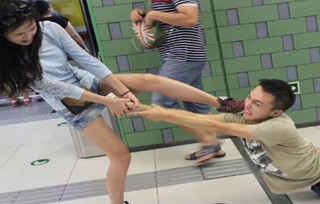 The man fell to the ground clutching his smartphone with the woman dragging him to the subway car! The woman supposedly dragged the man about 10 meters onboard to the train. Netizens have called into question the authenticity of it all. The whole thing does look suspect. Major Chinese websites such as Tencent have reported on the matter in a weird way, citing that the event took place on subway line 10, but when the whole thing seems to have taken place on line 6. There's also the question of no police apparently showing up at the scene as well as the awkward dedication the man has to his mobile game. If this was indeed a publicity stunt, and news media have pointed out the possibility, then what is the dragging of a man onto a subway supposed to advertise? If it's for a smartphone game, what game is it? What was the point?